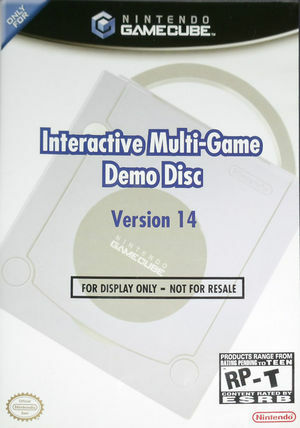 Interactive Multi Game Demo Disc v14 is a playable demo disc for the Nintendo GameCube. Disc 14 features the same contents as Version 15, minus previews of M-rated games. The sampler includes a simple menu and three playable single-player demos of Custom Robo, Mario Kart: Double Dash‼, and Sonic Heroes (with time reset). In addition to the playables, the disc also features a downloadable patch for Pokémon Ruby/Sapphire, plus a special Pokémon available with the GBA-to-GameCube Link Cable. The disc also features pre-release movie trailers of the following games: Pokémon Colosseum, Metroid Zero Mission, Final Fantasy Crystal Chronicles, Custom Robo, NFL Street, Need for Speed: Underground, The Sims: Bustin' Out, I-Ninja, and Mega Man Anniversary Collection. The graph below charts the compatibility with Interactive Multi Game Demo Disc v14 since Dolphin's 2.0 release, listing revisions only where a compatibility change occurred. This page was last edited on 3 March 2018, at 12:21.